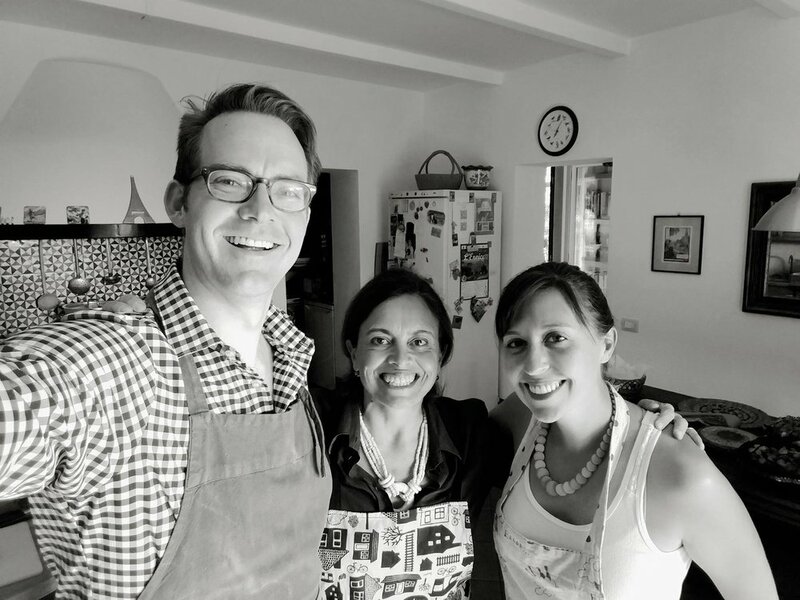 This month I hosted my first ever Cooking Vacation in Tuscany. From October 2 - 9, 2017, a group of 8 women from New York and Florida joined me and my business partner, Chicca, in Italy for a week of cooking, wine tasting and touring. This idea was born last year when Nate and I spent the month of June staying with Chicca and her family through a workaway. We traded work for accommodation and food, which was basically the best deal ever because Chicca's place is heaven. She lives in a renovated Tuscan farmhouse an hour south of Pisa. Located just 7 km from the beach, her property has a beautiful garden and olive grove and is walking and biking distance to some of the best vineyards in Italy. Chicca teaches cooking classes from her home. She mostly caters to cyclists touring Italy with a tour group called VBT. So our "work" included helping her run her cooking classes, setting the table, showing guests how to prepare her recipes, doing dishes and generally being on hand to make sure that cooking class guests had a nice time. Needless to say, it was one of our favorite experiences from our entire year of travel. On several occasions, Chicca and I talked about how we could work together again. After our time on the road was up, Nate and I headed back to the U.S. where we moved to Denver, CO. I moved my business, tipsycooks, to Colorado where I started teaching private cooking classes in people's homes. I did this back in Chicago, so while there was more paperwork involved, the transition wasn't too bad. All the while, Chicca and I stayed in touch. We'd Skype or Facetime every other week to catch up and dream up ways we could work together. We decided to create a weeklong cooking experience called a cooking vacation. The itinerary would give people interested in food (or just people that like to eat) a more immersive culinary experience and more time to digest and explore the area around her in Western Tuscany. We spent hours on Facetime creating what we felt would be the perfect week of wine tastings, visits to local farms, sunset cocktails and cooking classes. Finally, we both began to promote the experiences on our websites and to our social media followers. As we rebuilt our lives in Denver, I also started guiding food tours downtown. It's been a fun experience and has helped me immerse myself in the food scene here while meeting fun travelers from all over the world. I take people around to 5-6 tastings across the downtown area and talk about the chefs, how the restaurants got started and the food scene in general here in Denver. I also give an overview of Denver history and architecture along the way. The food tour has been a great way to get connected to foodies from all over the world. One day I had a woman on my tour from New York who took an interest in our upcoming cooking vacation in October 2017. I gave her my card, and sure enough heard from her the next week. She booked our first cooking vacation with 7 of her friends from NY and FL. We officially had our first guests! I returned to Italy by way of Paris on a brutally long set of flights. Luckily, I was able to use my American miles, which meant the total spent was just $220. I arrived back at Chicca's exhausted but so happy to be back in one of my favorite places on Earth. Arriving to Chicca's after a solid 24 hours of traveling. I immediately ate pasta! Our guests arrived by train just one day later, and we were officially off! We welcomed the group with a dinner out their first night where we started to get to know everyone. We also got a chance to go over the itinerary for the week so everyone was on the same page on what we'd do. The following days felt like a full-on marathon. Chicca and I had a blast but learned quickly how exhausting it is to be "on" all day every day. We would pick our guests up in the morning to tour a local village or visit a vineyard and then head out to lunch. In the afternoons, we all got a short break as we dropped guests back at the hotel to relax and rest. In that break, Chicca and I would run around the kitchen preparing for the evening's cooking class and making sure the table was perfectly set. We would open wine bottles, measure flour, chop garlic and pick herbs from the garden so that the cooking classes went smoothly. Three generations on one Cooking Vacation! Every evening except one, we cooked a full three-course meal together. We made homemade cavatelli, gnocchi with butter and sage, apple and blueberry tarts, milk-braised turkey, homemade tagliatelle, ricotta mousse and more. After the cooking classes were done, and our guests retired back to their hotel, we'd get to washing dishes and cleaning the kitchen so that everything was ready for the next day. The days were long but rewarding. Chicca and I regularly made eye contact throughout the week and said to each other, "I can't believe this is actually happening!" We really felt like this dream we had together was coming true. And I felt so relieved having a partner. With my business in Denver, it's mostly me. And on the food tours, it's just me and my guests. It can feel lonely when things get stressful people you can never let on to your guests that something's gone wrong. With Chicca, I felt like I had a partner in crime. When I would get stressed and tired, she would step up and vis versa. We both commented at the end of the week how nice it was to share the emotional and physical load. We also learned a lot from our first experience. Every day I carried a notebook with me and took notes on how to improve the experience. Everything from "make the lunch reservation earlier!" to "people need more time to tour the village" went in the book. After our guests left, Chicca and I spent hours pouring over our notes and our guests' surveys to see what went well and what we can change for next year. After a very full week, I also got a little over a week myself to relax and enjoy. When Chicca and I weren't visiting potential hotel options for 2018, I got to go to the beach, cook with Chicca and her workaway guests, and we even harvested her olives and took them to the mill to make olive oil. I also got a chance to head out on my own. Last year when we were in Italy, Nate and I did not have a car, so we relied a lot on the train system. This time, I rented my own car from the Pisa airport, so in the second week, I headed out to explore a bit more of Tuscany. I drove to San Gimignano and walked the cobble-stoned streets of this incredible medieval city. I also had the best gelato of my life there. Then I headed over to Siena where I spent two nights staying in an airbnb room. I explored the piazza, ate picci (the local dish of thick homemade spaghetti) and chiati butter (that's just lard) and drank delicious red wine each night. I also got a chance to take a tour of my own. I did a full-day wine tour to Montepulciano. It was surreal after a week of leading my own tour to sit back and have someone else drive. We visited a local sheep farm and got to try fresh sheep's milk cheeses. We walked around Montepulciano and visited two wineries. I also learned a little bit about truffles, the incredibly expensive mushrooms that grow underground in that area of Italy. Did you know that there's a breed of dog specifically raised to hunt truffles? They're (creatively) called truffle dogs, and they're fed truffles exclusively when they're puppies to get them hooked on the smell and taste. Once they ween them off to a less expensive puppy food, the dogs will spend the rest of their lives hunting truffles out of the ground. A single truffle the size of your fist could sell for $1,000. At the end of my second week, I begrudgingly headed home. I was really missing Nate, but I realized that I didn't necessarily miss our home in Denver. On many occasions, I thought to myself, "Man, I miss the trip." What I wanted more than returning to our apartment in Colorado was for Nate to be meeting me up with his own backpack. I wanted us to be catching a train to Naples or the Amalfi Coast or some other place we'd never explored before. While I love our more settled life here, it reminded me how amazing our trip really was. The day after I got back, Chicca and I were already back on Skype making plans for our next Cooking Vacation, which is scheduled for June 23 - 29, 2018. We also have availability October 1 - 7, 2018. I will definitely be returning in June 2018. We already have 6 guests booked and only a few more spots available. We want to continue keeping the groups small as it allowed us to really get to know people. In the meantime, I'll just be here working, planning and trying to re-create my favorite Italian dishes with the capers I smuggled back in my suit case. Want to join me for my next Cooking Vacation in Tuscany? Check out upcoming dates and itineraries here. Older PostHow to House Sit Your Way Across the U.S.